Sterling Silver MoonStone set Rings. Moonstone has a certain way that it reflects light to give the fiery colours and amazing glow that you only find with this semi-precious gemstone. Fire MOONSTONE and Blue Rainbow coloured stones all set in polished 925 Silver Rings creating elegant Moon Stone Jewellery with the reflected Blue and Rainbow hues that this attractive material offers your jewellery. Medium Moonstone set Sterling Silver Ring. 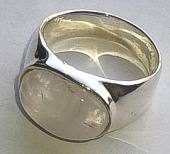 Polished oval Moonstone set in centre of Silver Ring band. Large Sterling Silver Moonstone set Ring, approximately 15mm x 10mm large polished oval Moonstone. Sterling Silver long polished Moonstone inset elegant ladies Ring.